HAPPY NEW YEAR!! It’s the first Tuesday of 2016– writing that feels so strange! Where does the time go?? As per usual at the start of the New Year, the Top Ten Tuesday topic is our Top Ten Resolutions for 2016. I feel like these could be considered more like goals than resolutions— or is there even a difference? (Says the English major!) Anyways, on with my bookish plans for 2016! 1. Read at least 24 books. I’ve decided to keep the same Goodreads goal as I had in 2015 even though I easily surpassed it last year. I’ll be away at college for the majority of 2016, so I won’t have as much time to read besides what I’m assigned to read for classes. Also, a lower goal allows me to take my time with the books I do read and even read some longer books without having to worry about them being too much of a time commitment. 2. Read more classics. Lately I’ve been reading a lot of classic literature, both due to my college classes and because I’ve been enjoying exploring that genre. I’d love to continue to do this in the new year and hopefully be able to check off some of the books on my Classics Club reading list! 3. Read more nonfiction/memoir. Every year when I look back at the books I’ve read I always feel as though I never read enough from the nonfiction/memoir genre. There are some really great nonfiction books that I have on my TBR list for 2016 (take a peek at my recent book haul for more info) so I’m hoping they will get me off to a good start. 4. Read more works by Charles Dickens. In the AP English class I took in my senior year of high school I read A Tale of Two Cities and Great Expectations by Charles Dickens, the latter of which I absolutely loved. I’ve been meaning to read more of Dickens’ work ever since, but for some reason I just haven’t gotten around to it. 5. Read at least 3 books in Spanish. Over the past year or two I’ve been trying to read more books translated into Spanish. Since I’m now going to be a Spanish major in college, I figured that it’s about time I start doing this more often. I’ve got several Spanish books on my shelves that I’m looking forward to reading, so hopefully I can finally get around to completing this goal in 2016. 6. Organize my bookshelves. At the moment my bookshelves are kind of getting out of hand. The bookcase in my bedroom is overflowing with books, many of which I read years ago and have no intention to read again. Sometime in the near future (maybe before winter break ends?) I need to sort through all of my books and decide which ones I want to keep and which ones I want to donate. Then the reorganization process really begins! 7. 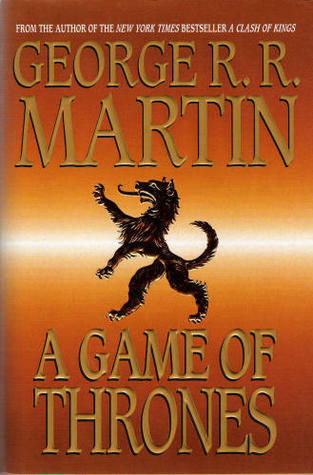 Finally read A Game of Thrones by George R.R. Martin. I feel like this is a major fandom that I might enjoy, considering that many people have told me that it’s sort of similar to LOTR. I’ve never watched the TV show or read any of the books, but hopefully I can get around to reading at least the first one this year. I mean, if my brother read it (he never reads willingly) and enjoyed it, then I should be able to, right? 8. Read more of the books I own. I love books so much that I just want to own them all. The problem with this is that I have so many piled up in my room that I haven’t read yet, and they end up sitting there for AGES before I finally get around to reading them. Hopefully this year I can trim down that physical TBR (and maybe make room for some new ones?). 9. Read slowly. This is more of a mindset for me than the actual pace at which I’m reading. Sometimes I get so caught up in wanting to read all the books! that I miss out on appreciating whatever book I’m reading at that moment. In 2016 I want to stop reading hurriedly and start reading in a more relaxed way, if that makes any sense. 10. Have fun! As always, I think this is the most important resolution to make. Above everything else, reading should be fun! What are your resolutions or goals for 2016, bookish or otherwise? Let me know in the comments section below! I hope your New Year has gotten off to a great start! I also want to read more Classics. I feel like I need to try and step out of my YA box, just to see what its like. 🙂 Good Luck! Spanish books? That’s great! I should really try to read more books in French, but it takes twice as long as I try to figure out idioms and whatnot. Good luck! I keep thinking that I need to read more classics! Maybe one day! Yes, yes, yes! I can relate to having to slow down in order to savor a book. There are just so many books that I want to read. I have been reading more classics, and would like to continue with that too. Thanks, best of luck with your goals as well! This sounds like an amazing list! I think your goal to read more slowly will benefit you greatly, as savoring each book will make them more enjoyable! Good luck! Sounds like we all have a problem with our looming to-read lists! Good luck! Thanks! 🙂 Happy New Year! Right?! Reading for fun is where it’s at 🙂 Happy 2016! Good luck with all of them Holly! Sometimes I find myself saying “I need to finish this book” instead of “I need to appreciate this book.” Slowing down is a great idea and I’m sure it will be rewarding. I love reorganizing my shelves, I think it’s really relaxing actually, haha. Good luck in this new year! Have you ever tried a popular children’s series translated into Spanish, like Harry Potter? I did that to practice my German. I read the second Harry Potter book (one of my favorites) in Spanish last year and really enjoyed it. I definitely agree- children’s books are a great way to practice another language! Thanks so much! 🙂 Happy 2016! I am inspired by your list comprised of great reads. in my opinion it is clear that you enjoy traveling. That is the innate beauty of reading. You can go where ever and whenever you choose. Enjoy your travels.